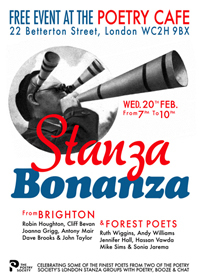 Six of us from the Brighton Stanza are reading this evening alongside six Forest Poets (Waltham Forest) in a ‘Stanza Bonanza’. I don’t think it’s a competition, more like a friendly mingling of Stanzas. Anyway we are definitely the away team. And Paul McGrane of the Poetry Society won’t be there supporting his own Stanza (Forest) because he’ll be at the Orient. Ah! So it takes a bit of footie to find out where people’s priorities really lie! As a special ‘thank you’ for sitting through yet another poetry night, I’m treating my long suffering husband to drinks in the bar at the top of the Gherkin beforehand. Hurrah! So now all I need to do is decide whether to read one of my new ‘poem a day’ efforts, or whether it needs a bit of cleaning up first. Really looking forward to hearing what my fellow Brightonians come up with, and also the Forest Poets who are all new to me. 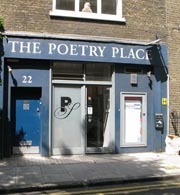 If you’re in London, do come along and give us a cheer – 7pm at the Poetry Cafe, Betterton Street.